Birchbox, which offers a monthly subscription box full of new cosmetics and beauty products, is expanding to a new vertical today — home and entertaining and design. The company is debuting a limited edition box as well as an online shop featuring specially curated home décor and entertaining products. For background, the Accel-backed company sends its subscribers a box full of sample products ranging from lotions to lipstick and mascara for $10 per month If customers like what they see, they can go on Birchbox’s site and buy more. With many people entertaining during the holidays, the timing is right for a home and entertaining-focused vertical. The home decor box is a little bit pricer than the cosmetics package ($58), but is designed for anyone throwing a holiday party and includes cocktail party accessories, kitchen tools, gourmet foodie finds and more. 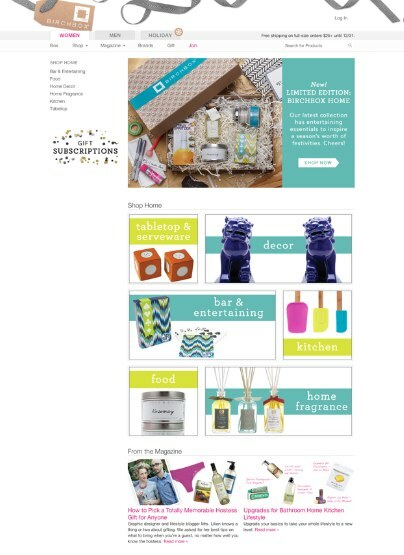 Brands include Jonathan Adler, Dean and Deluca, and Paperless Post. The Birchbox Home store features a handpicked selection of home design and lifestyle products and relating content. Products include tabletop accessories by C. Wonder and gourmet sugar from Chambre de Sucre. Accompanying editorial content will spotlight brands, designs and new trends. This is the third vertical for BirchBox. In April 2012 Birchbox launched Birchbox Man. And in September, Birchbox announced the acquisition of Paris-based JolieBox to extend the brand’s international footprint. The company has raised $12 million from Accel Partners, Harrison Metal, First Round, Forerunner Ventures, and Lerer Ventures. Walmart just entered the subscription commerce market with the launch of Goodies, a food-focused service.